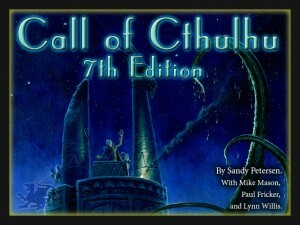 Yep, the Kickstarter for Call of Cthulhu 7th Edition is live. If such things interest you, here’s your chance to make things happen. I can say that in the two playtest games I was able to take part in that I didn’t personally care for the changes and additions to the system. But just because they weren’t my cup of eldritch ichor doesn’t mean that you won’t enjoy their flavor. Speaking of the playtests, I can’t answer any questions about the new version of the game because (a) I think I’m still under an NDA and (b) I don’t really remember much except not liking the changes. Hopefully there’ll be a bit more information available than is currently up on the Kickstarter to help people understand if the changes will be to their liking. This entry was posted in Call of Cthulhu on May 28, 2013 by the venomous pao. Lynn Willis, one of the biggest of the big daddies of the entire Basic Roleplaying family of games has passed away. Mr. Willis was, among countless important roles in the RPG industry, the co-creator of Call of Cthulhu, but his contributions to our hobby extend well beyond that august accomplishment. My sympathies are with his family and friends and my gratitude for what he gave us is sincere and immeasurable. This entry was posted in Basic RolePlaying, Call of Cthulhu on January 18, 2013 by the venomous pao. Wherein your humble scribe, being in a Lovecraftian frame of mind of late, presents an NPC for use with Call of Cthulhu (Sixth Edition). Sean Patrick McGuinness is a 28-year-old, second-generation Irish-American from the Vinegar Hill neighborhood of Brooklyn. Like his father before him, Sean made his living as a sandhog on subterranean projects throughout New York. But after the Holland Tunnel Incident of October 27, 1924, McGuinness’ career beneath the earth came to an abrupt end. The official version of that dark day’s events involves a tunnel blowout, the deaths of nineteen men, and the amazing survival of one incredibly lucky sandhog who was actually drawn into the blowout, forced through the mud of the river-bottom and delivered to the surface alive. McGuinness, though, has quite a different story to tell, though he seldom shares it anymore. Friends and relations chalk up his fanciful talk of Shoggoths and Ubbo-Sathla and other such nonsense to the confusion and hallucinations caused by Bends, which he surely must have suffered as a result of the intense pressure changes he endured. Former coworkers and casual acquaintances have been known to mock McGuinness openly for his bizarre words and strange behavior ever since the event. Meanwhile, odd academics from strange universities occasionally seek him out and listen intently to every word this former teetotaler has to tell though his now permanent whiskey haze. No matter what truly happened down in the tunnel, two things are certain: first, McGuiness is absolutely terrified of setting foot below ground to the point where he won’t even enter a basement, let alone travel by subway; second, there has not been a night in the past three years when McGuiness has not woken, drenched in sweat, from an intense, thrashing nightmare crying “Tekeli-li! Tekeli-li!” at the top of his lungs. This entry was posted in Call of Cthulhu, NPCs on February 3, 2011 by the venomous pao.